So now you’ve gone grocery shopping, and your kitchen is locked and loaded, at the ready with heaps of fresh fruits and veggies. What good news! But how do you store all this bountiful goodness? How do you keep it from rotting, and leaving you and your good intentions a couple of bucks in the hole? With a little bit of care, you’ll find that your groceries will last you a decent amount of time. This is the most common mistake. For one, tomatoes should never, ever, EVER be stored at anything less than room temperature. Cold temps break down their cell structure and turn these red beauties into mush. The same goes for bananas. To keep track of what’s what, use your head: Bananas are a tropical fruit, and thus hate the cold. So, don’t put them in your fridge—put them on your counter. The same goes for other warm-climate produce like mangoes, coconuts, papayas, and avocados. You’ll also want to keep other items with a singular pit or seed at their center—like peaches, plums, and cherries—out of your fridge. If the fruit isn’t ripe, then place it in a brown paper bag on your counter. Give it a gentle squeeze in the morning; once the flesh starts to soften and give way, you can move it to the fridge. This will extend its shelf life for another two to three days. The same goes for melons. Unless you’re ready to slice and dice, then they should not be occupying a slot in cold storage. Once you’ve gotten ultra-fancy with your melon baller, then the cut fruit can be placed in the fridge for (you guessed it) two or three more days. If the fruit is ripe when you buy it, plan to eat within 24 hours so you don’t attract fruit flies. While we’re at it, keep garlic at a cool room temperature, but out of the fridge, too. Once the temperature starts to dip, garlic will begin to sprout, and that’s not what you looking for in a clove. Place any bulbs in a small container and store in a cool, dry space. Shoot for under 60 degrees. A lower kitchen cabinet, away from the oven, will do you nicely. In fact, this storage tactic works for quite a lot of sprouting produce: potatoes, squashes, onions, and apples, to name a few. Their starches won’t turn to sugars quite as quickly, which retains their tasty flavor for up to two months. Don’t wash your produce until you’re ready to use it! External moisture is the enemy. If you give it a rinse and don’t let it dry completely 100 percent, the excess water droplets will cause slimy, brown spots and rot. So keep ’em riding dirty until cooking day. However, the internal moisture that’s inside your veggies is good. It keeps the flesh nice and tender. So cut the greenery off your carrots, beets (you can eat the beet greens), and other root vegetables. Otherwise, the leaves at the top will steal internal moisture from the vegetable and dry them out. When all else fails, the general rule is, water outside? No! Water inside? YES. There are exceptions to the rule, however. I’ve said it before: Spices are the key to your kitchen, and nothing beats fresh herbs. However, you’re often forced to buy a large amount at the grocery store–way more than is required for one recipe–so you’re going to turn them into little herb bouquets. Cut the bottoms of tender herbs like parsley, cilantro, dill, and mint, and place them in an inch or two of water. Transfer to your fridge and they’re like a tiny present waiting for you on the shelf. I’ll even do you one better. Change the water every day to keep the bottom leaves and stems from getting slimy. Now your herbs will last for up to two weeks and can be dished out for multiple recipes. The exception to the exception is Miss Basil, Queen of Fresh Herbs. She cannot tolerate cold temperatures on her tender petals. Place her gently in a couple of inches of water, but keep her on the counter. Or, get a basil plant, ’cause this stuff grows like a damn weed. If it starts getting really out of control, you can freeze it by storing the picked leaves between the folds of a paper towel, or throwing it into the blender with some olive oil and putting the mixture in an ice-cube tray. (Handy for individual servings!) Frozen basil can turn a strange blackish color, but it’ll taste the same in your pestos and red sauces. You should also cut the bottoms off your asparagus and put them in shallow water to help them stay nice and firm for up to a week. Instead of buying picked brussels sprouts, try and purchase these guys while they’re still on the stalk. Place the stalk in water and pluck the sprouts as needed. They’ll be good for up to two weeks; all you have to do is peel the outer leaves. This is important! Different materials react strongly with different chemicals, so here’s a breakdown of what goes where. Plastic bags: If you tend to infuse your drinking water with a nice healthy dose of lemon or lime—or find yourself otherwise using them frequently— then keep your citrus stored in a sealed plastic baggie. These puppies will absorb the nasty odor of the leftovers that have been rotting on the third shelf for the past two weeks. (No worries, it happens to the best of us.) The plastic protects from less than desirable smells, while the cool temp will keep them from drying out and losing their juice. If you won’t be using all the sections right away, then you can pop them into a small container. Otherwise, plastic bags are bad environments for most other vegetables. Citrus is unique because of its rind. Other veggies should go in foil—see below. Tupperware: For the record, I’m not a fan. Tupperware went BPA-free in 2010, but it still absorbs the color and smell of the food you store. You shouldn’t use it in a microwave or dishwasher; it’s shady as hell. Glass containers, for the win. If you must, use Tupperware under extreme storage circumstances only. Like those times when you have 150,000 carrot sticks left on the vegetable tray after a party, or you have to bring something to a friend’s potluck and you know that jerk will definitely not return your serving dish if you leave it there by accident. Also, you should really only be using containers after your produce has been cooked. You know the crisper drawers well—they’re those two drawers at the bottom of your refrigerator. Guess what? They’re not only for your random half-eaten tubs of hummus. Your vegetables and fruits should not mix, and your crisper is there to help facilitate that. Don’t put your peaches next to your eggplants! Don’t put your grapes next to your green beans! The fruit gives off ethylene, which in turn attacks the vegetables, and everything starts to go bad all at once. So, while strawberries might taste delicious in an arugula salad, they shouldn’t touch until it’s ready to hit the plate. They can only co-mingle in controlled environments. Put your fruit in one drawer and make sure the humidity is set on low. Keep your veggies, especially leafy greens, in the other drawer and make sure the humidity is set to high. 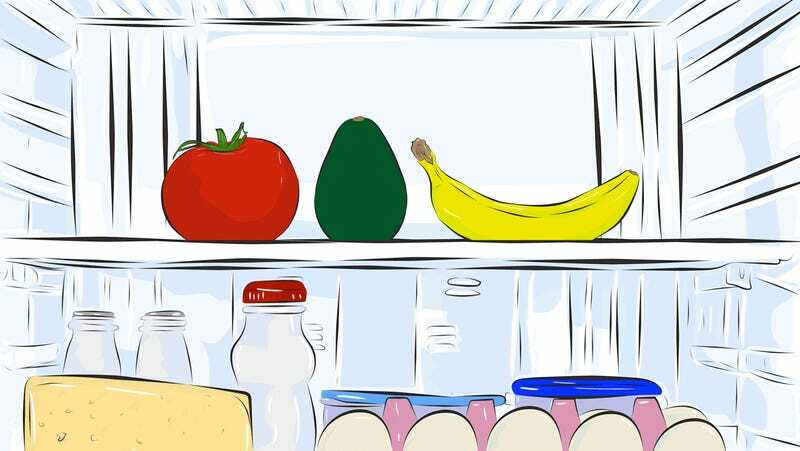 If your fridge doesn’t have those settings, then put fruits on the top shelf and veggies in both drawers. As far as berries and fresh lettuces go, we can really skip storage discussion altogether. Those should be rinsed and eaten ASAP at all times. If you’re not snacking, then they belong in the fridge and nowhere else. Same goes for cucumbers, which should be eaten within three days unless you want to try your hand at pickling. Lindsay Hood is a writer living in Seattle. She tweets at @LindsH.